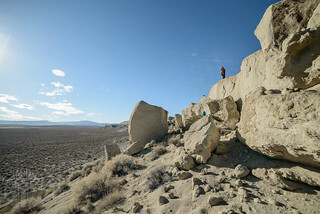 Jess and I with our two youngest travel to the southern edge of prehistoric Lake Idaho for a sunny walk around one of the world’s more unique environments. I am led by some guy I haven’t met before, Michael, down hours of mountain single track around Deadwood Reservoir. We start up to Bogus, through Placerville and Crouch before hitting narrow mountain trails I’d never ridden before — adventure as usual. Jessica, Hunter, Brenna and I head to Boulder Basin north of Ketchum, Idaho, to spend the night at 9,700 feet among the tailings and crumbling log cabins abandoned some sixty years since metals were last dug and dissolved from the high rock arena. Plans for an easygoing day go the way such plans usually do. 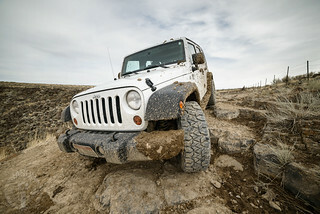 We take an unexpected run at Windy Ridge and make an unexpected visit to one of our 2010 campsites. “Unexpected” is the word of the day. We conclude the day laughing around a fire under tall cedars. All’s well that ends well. We are ready to ride, year six. 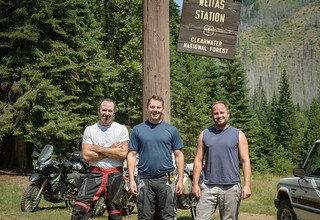 We point our three motorcycles east from Pierce to Weitas Creek across forest roads and trails. What should be a short day of riding turns into something else. 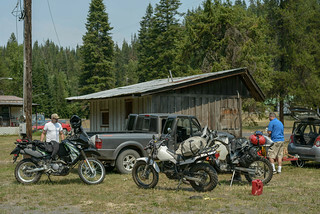 I haul two motorcycles — one for me, one for Jeremy — to Pierce, Idaho, starting point for the year’s Abbott Brother ride. I am there an evening in advance to secure our spot so I use the extra time to visit historic sites around the town. 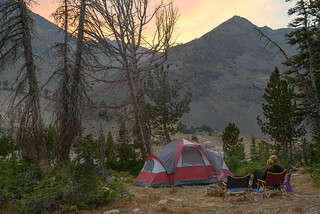 I camp two nights for a local club ride meant to climb the challenging trail to historic Boulder Basin near Sun Valley. There is camaraderie and beauty in the midst of defeat. Brenna and I drive to the recently opened Trinity Recreation Area to camp along Big Trinity Lake and feed the mosquitoes. She swims, makes me a flower salad and map while I prepare the hotdogs and marshmallows. After a restless night we leave to the sunrise reflecting fire off placid waters. I go alone to follow narrow trails along unexplored Lava and perhaps Rattlesnake Mountains. I hope to reach North Star and Smith Creek Lakes seen on the map. The scenery is the best I know this close to home even as aches and pains remind me of my age. Little Brenna and I take the doors off the Jeep for a drive to Idaho’s historic Silver City and the surrounding alpine mountains. On the way we stop at the Owyhee Museum in Murphy then begins our search for the gold we finally discover in the setting sun with only a minor loss of skin. Hunter and I trailer to the Eighth Street trailhead then ride the rest of the way to the ridge and Eagleson for his first overnight trip off the motorcycle. 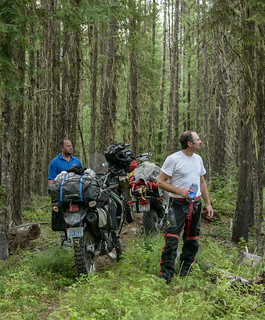 We see a skink, sit around a fire, sleep and ride home through some difficult mental terrain. My brother Joel and I explore the ATV and single track trails around Skyline Drive in McCroskey State Park before setting up camp in view of Moscow Mountain. 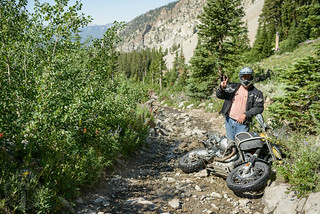 I explore the hills next to town, up Trail 4, down Humpty and back on Eagleson and Rocky Canyon, looking for a place Hunter and I might do a quick overnight ride. Hunter and I trailer our motorcycles to the Hemingway Butte riding area where we spend the afternoon improving our hill skills. 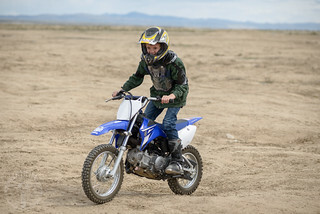 Hunter does great, especially considering it’s only his second motorcycle ride. I ride over the hills to the Danskin area for my first overnight trip of the year and first time camping from the KTM. Luggage woes and difficult trails keep me from getting as far as planned but morning along Willow Creek makes it all worth it. After a couple months parked in pieces in the garage, I finally get the new KTM out for a first dirt ride on the Danskin trails under patches of blue and between sheets of rain. The whoops are more pleasant than on the GS and the singletrack more inviting. Usually obscured by layers of rock and recollection, there are places where the history of land and people unfolds to reveal our own small place in the twining and termless chains of causality. Jess and I with the two youngest, a mermaid and some Pringles head over the mountains hoping the Kirkham Hot Springs are just that — hot — in spite of the deep freeze that has settled over Idaho. We test some extremes of hot and cold.